Gail Borgatti Croall is a medical director for Aetna, where she is responsible for utilization management, case management and care collaborations in the Mid-Atlantic region. She has had a wide range of managed care experience including practicing pediatrics in a large multi-practice group and executive-level roles for United Healthcare and Anthem. 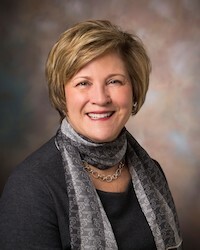 She has previously served on boards for the Visiting Nurse Association, The Emily Program, Cincinnati Center for Developmental Disorders and Stepping Stones. She received her Bachelor of Science degree in biology and chemistry from William & Mary and her M.D. from The Medical College of Virginia. She completed her pediatrics residency at Cincinnati Children’s Hospital Medical Center, with an additional year fellowship in developmental pediatrics.